We have something deliciously special and different for you this month, writerlings! 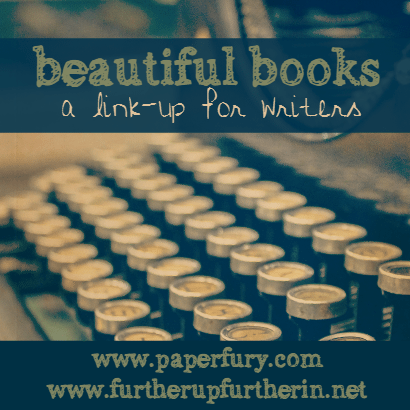 Around this time each year, Sky and I pause our Beautiful People writers linkup and switch gears to Beautiful Books — where we talk about our NaNoWriMo projects. Not doing NaNo?! NEVER FEAR. These questions fit with whatever manuscript you’re working on. How did you come up with the idea for your novel, and how long have you had the idea? Why are you excited to write this novel? What is your novel about, and what is the title? Which character(s) do you think will be your favourite to write? Tell us about them! What is your protagonist’s goal, and what stands in the way? What is the most important relationship your character has? How does your protagonist change by the end of the novel? What themes are in your book? How do you want your readers to feel when the story is over? BONUS! Tell us your 3 best pieces of advice for others trying to write a book in a month. If you have trouble with the button, just save it as a file, then upload it to your blog, and add a link to my blog manually (like you would link text). THIS IS AWESOME!!!! I’ve always loved your Beautiful Writers questions, but couldn’t join in since I never do NaNoWriMo – I don’t think I can in the near future either. I don’t work well with deadline when it comes to writing. I’ve been wruting my WIP of months now! The way I am going, I’ll be one of those authors who wrote a book for five years. Ah, but that’s okay! Because slow and steady wins the race, right?! And this isn’t just for NaNoers. 😉 So if you doooo want to introduce us to whatever you’re working on anyway — WE WOULD BE MONSTROUSLY EXCITED TO READ IT!! I’m going to bookmark this page cause I want to do this one! 😀 I can just post it whenever this month, right? YAAAAY. And yes, anytime! The linky closes in November, but you can still do it any time of ever. Yayyyy NaNo is coming! I’m ridiculously excited for this one — it’s actually my second NaNo only, counting Camp NaNo, but I’m still crazy excited. I’ll be writing an urban fantasy — my first, actually — that is also my Mulan + Swan Lake retelling. My NaNo advice — well, I’ve got some, such as don’t censor your own writing, including any excess dashes *glances shiftily over comment*, but really, the main one is to HAVE LOADS OF FUN. What’s the point otherwise? I’m actually such a socially awkward crab I don’t think I’m going to sign up on the site. I have myWriteClub for logging progress which is more flexible, and I survived Camp NaNo just fine without signing up, soooo. Yay, excitement! My post is up! My advice: Don’t panic!!! And Write good Words. This is so great! Just what I’ve been looking for to get myself focused and committed to NANOWRIMO this year. I’m not allowing myself any excuses! I am doing NNaNoWriMo, but I don’t know if I’m going to manage 50,000 words because I’m doing what will hopefully be the final rewrite of that novel I was supposed to have given up on (also, uni).. I’ve put the first draft of my fantasy on hold for it because, TECHNICALLY, this idea was supposed to be finished over the summer. The story I’m doing is a snarky, highly exaggerated coming-of-age novel. It’s my second year too. Do you know what you’re doing yet? AGH. I’m not doing NaNo this year because November is like my busiest month. >_< Could I still do this tag for my WIP? It might motivate me to start writing it again, because I abandoned it for focus on other projects and I want to start it up again. I was all ready to go for NaNoWrMo, I swear! I had my booked picked out, planned, and scenes outlined. Then disaster struck…I came up with an idea for a DIFFERENT book that I’m WAY more excited about! I feel like it’s got so much more heart than the first one. Even so, it’s still just a baby idea. It’d probably benefit from being stewed over for a year and used NEXT November for NaNo. But now I want to spend all my time thinking about the new idea instead of the old one I’m supposed to be working on. Bugger. OMG. I KNOW THIS FEEL. I’ve been so stuck with plotting for my original NaNo book that I started thinking up a different one and…well you know how it goes. >_> Although I AM sticking to the original plan. hah. But YEAH. Some books need more stewing time! It is true. This is like the hardest part of being a writer, right!?!? You know, after years of taking a break I’m finally feeling it again and I’ve started a story. I’m really excited about it and I’m outlining the story and I’ve made a beginning. It’s still far from perfect, but it’s good to be back in action 🙂 I might post the answer to these questions someday! Sounds like fun and a good way to introduce others to what you are working on. Omg omg! MEL! THIS IS FABULOUS NEWS!! And stories don’t need to be perfect while we’re only just starting them, right?! I really can’t wait to read your post! I think that’s true! But I’m a perfectionist and sometimes I want to make it the best version possible right away :p I just try to let go of that feeling and just enjoy the fact I’m finally able to write something down again. I realize now how much I’ve missed it. Huzzah! Beautiful Books! 😀 I was kinda hoping you’d do this because I DO need to work on my NaNo, and I was thinking of introducing it on my blog sometime this month… So this is perfect! And fabulous timing! I’M TOTALLY DOING THIS NEXT WEEK YES. YAAAY!! Sorry it’s so late too! 😛 We kind of forgot and then got distracted and then were both so busy we couldn’t catch each other online to organise it! BUT YAY IT IS REALLY FUN SO I HOPE YOU LIKE THE QUESTIONS. I never heard of NaNo before your blog! It wasn’t until this post that I figured out what it was! Very cool! Oh you are a veteran then, obviously. And I mean, even if a book doesn’t work out too well, you always learn something from a draft, right!!?? Love these questions–I’m setting up my post for tomorrow! This is my sixth NaNo (my first time not doing YWP, though, which is a little scary . . . I COULD do it, sure, but I think the time has come for 50K.) And I’m writing YA fantasy, again. I’ve won NaNo three times so far (the years I was ten and eleven, I gave up partway, but my first, fourth, and fifth NaNos were all completely successful) but never finished a story except for my first time, so that needs to change this year. And I need to talk my characters into being snarky. My WIP characters are snarky. These ones . . . are not. Yet. Maybe my protag, but she has no one to have sarcastic conversations with . . .
Talking characters into being snarky is a must. XD My favourite is having a mega snarky character coupled with one who doesn’t get humour at all. XD IT’S SO FUN. My goal is obviously to do better than last year. Last year, I wrote 1200 words, then deleted 800 of them. So.. 400 words is not a NaNo success, and I just ended up frustrated. But I am vowing to at least make a dent this year! Aww, don’t be scared, Shannon! 😀 OKAY DO BE SCARED. WRITING IS HARD. OMG. But even if this isn’t your “big book” yet, it doesn’t matter. The more drafts you write the better writer you’ll be. Like my recent book (that I just did the snippets on) omg I thought it up at the beginning of the year but I wasn’t ready to write it. I NEEDED TO PRACTISE MORE FIRST. I feel like it’s one of the biggest books I’ve ever written. 0_0 SO YEAH. *whispers* I reckon you should go with the one you have the most information about. 😉 WHATEVER MAKES IT EASIEST FOR YOU. THANK YOU, my dear 🙂 I have a feeling you are right. Because I DO need the practice, and it just makes sense to do the one that I have a better grip on. Plus I mean, I LIKE the idea obviously! Eventually I hope I will be ready to give the other one a try. I think for now, I am too afraid to fail at that one! So good choice, thank you for the help! It’s my first time doing NaNoWriMo, so I’m nervous. I hope I can reach my goal. Even though I have school and other stuff, I really hope I reach my goal. I would love to have a finished manuscript. I’ve been writing and working on my novel for so long. It would be so rewarding to finally see some results. Omg, best of best luck Kristen!! 😀 I SHALL BE HERE TO ENCOURAGE YOU IF YOU NEED IT! And it is uber rewarding to have a finished book under one’s belt. *nods* One of the best feelings I think. I will definitely have to friend you in a little bit, when I have more time to do things on the internet. But I seriously love these questions, and I will probably use them as I do a bit more planning. This will be my third NaNoWriMo. My first time, I wrote three books. Last year I wrote three books and two halves. This year, I’d love to write 5-7, but we’ll see how that goes. My major project is going to be a science-fiction-y thing, but there will probably be at least two other science fiction projects, two fantasies, and possibly a contemporary. Time though–that’s a little more problematic. Sleeping is optional, right? Excuse me but I can’t right now. 5-7 WHOLE BOOKS IN ONE MONTH?!?!??!?!?!?! I think sleeping is optional. Also communication with other humans and eating and, like, bathing and stuff. Totally optional. Just skip it. Woo! Nano is coming! I am insanely excited to do this one (I have gotten absolutely crazy with my outlining. Almost done with the scene-by-scene!) and cannot wait for November. This is my second Nano, and although last year I fizzled out at about 17000 words, I am going to make it this year (because I don’t want my crazy outlining to go to waste). Omg, that is awesome!! I’m hoping to do that for my outline too. Right now I just have 3 pages of what-will-happen but I neeeeed more DETAIL. XD Detail makes me write faster. Omg, I hope you have good luck for this year!! I am not doing NaNoWriMo, but as you said, these questions are great anyway. I was so excited I have started my post already! Ohmygoodnesss I just signed up for NaNoWriMo. I can’t believe I did that. I’ll be even more surprised if I actually follow through and participate, but a good chunk of me hopes I do. I’ve dabbled in writing since before I knew how (seriously, I have journals filled with nonsense scribbling and pictures), but I’ve never actually written a novel despite the plot and character ideas floating around in my head. The horribly miserably failed attempt in my teens doesn’t count. Don’t ask. It’s embarrassing. Linked! And I promise to visit everyone on the linky! The linky isn’t working for some reason? Is that just me? This sounds really cool, I am defintiely going to do this as part of my NaNoWriMo update!